“Un Tajine” is a sort of stew from Morocco and is both the name of the dish AND of the particularly shaped pot that you cook/serve it in. Essentially, a Tajine is a stew that can feature any number of vegetables with an any meat that is slowly cooked in a sauce. This is a relatively simple dish to make (as most tajines are) but it relies on a key ingredient widely found in Morocco & France, the “citron confit” or candied lemon. You can make your own if you can not find the actual product in your local ethnic store so don’t sweat it much (check out the quick recipe at the bottom of the post). Although this recipe would traditionally be cooked and served in a Tajine dish, the Tajine is now used mostly for serving and “for show” than anything else. 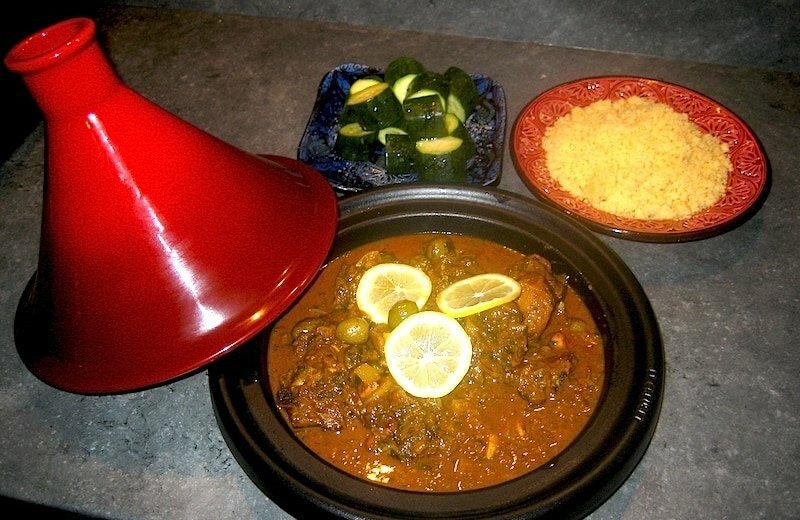 So you do not need to own a Tajine to enjoy a Tajine (makes sense?). It should be relatively easy to find in your specialty store or even via mail order. to not put too much meat in the pan at once so that it stays hot and browns not boiled! not move the meat constantly, just set it into your really hot pan and let it stay there. After a few minutes, you can turn a piece around to see if you are getting a nice coloration. If you do, turn the pieces once over and let them be for another 2 or so minutes, then turn one over to see if it’s browned. Remove the pieces from your pan and repeat the operation until you have no more pieces left. Then, dump most of the rendered fat out of the pan (leaving the equivalent of 1 to 2 tablespoons of fat). Lower the heat under the pan to medium and add the chopped onions to your pan. Move them around and at the same time, scrape the bottom of the pan to get all the brown parts into the mix. Add the Raz Al Amout and let the mixture soften and color a bit. Add the meat back into the pan and stir to coat all the lamb pieces with the spice and onion mixture. After a minute or two, cover with chicken stock. Set to simmer. While the meat is cooking, we’ll remove the white part of our lemons since it is bitter. Slice the lemons in 4 pieces and then run your knife parallel to your cutting board to remove all but the skin part taking care not to leave any white pith or membrane on the yellow part. Chop up the rind into pieces and set aside. Pit the olives and chop them roughly, set aside with the onions. When the meat is cooked through roughly (about 30-40 minutes) and the liquid has reduced, put in the chopped lemon rinds, olives and parsley/cilantro. Leave to cook for another 5 minutes. Serve with some couscous and, if you want, some steamed courgettes. As usual, let me know how it turned out! If you can not find them in your local stores, don’t worry, here’s a quick way to make them but you’ll have to plan it before hand since it needs to be made at least 24h in advance. Cut up the 3 untreated lemons into quarters. In a microwave safe bowl, mix the lemon quarters, salt, water and the juice of the remaining lemon. Cook for 10 minutes in the microwave on medium-high or 800watts. Mix the mixture every 2 minutes while cooking (make sure you put a loose cover on the bowl unless you want to repaint your microwave). Take the cooked mixture and put into a sealed jar. 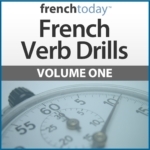 Set aside for at least 24 hours before use. 3-5 days is best. For another great recipe citron confit recipe that takes a few more days, check out David Lebovitz Moroccan Preserved Lemons.